Link to PDF of the BPC Newsletter Volume 2, Issue 2. 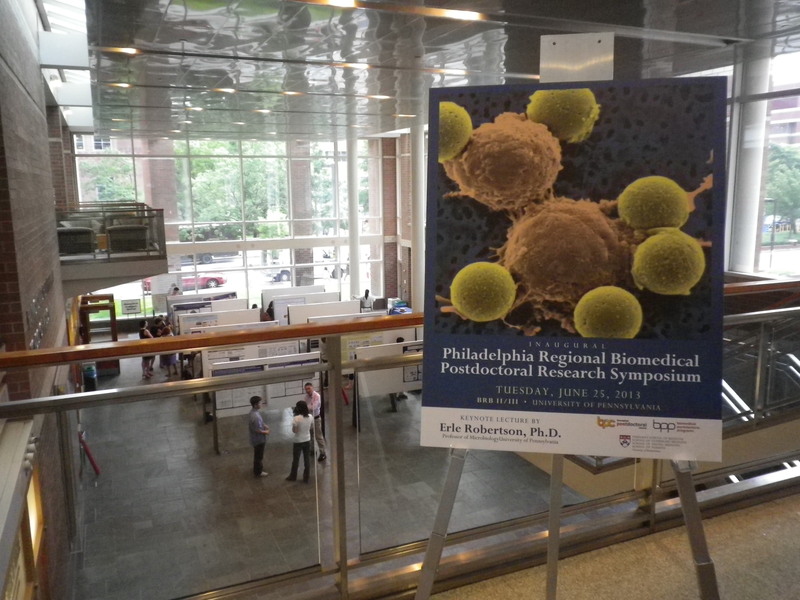 The inaugural Philadelphia Regional Biomedical Postdoctoral Research Symposium kicked off on June 25, hosted by the Perelman School of Medicine at the University of Pennsylvania. The symposium, organized by the Biomedical Postdoctoral Council (BPC) and Biomedical Postdoctoral Programs (BPP), attracted postdoctoral researchers from along the East Coast. Researchers came from institutions ranging from Mt. Sinai to Johns Hopkins to the National Institutes of Health (NIH). The full-day affair included a keynote address by Penn Medicine Professor of Microbiology Erle Robertson, Ph.D., oral presentations and poster sessions by postdoctoral fellows, and a closing plenary by Eve Higginbotham, M.D., the incoming Vice Dean for Diversity and Inclusion at the Perelman School of Medicine at Penn. The symposium began with comments from Susan Weiss, Ph.D., Associate Dean for Postdoctoral Research Training, and Larry Jameson, M.D., Ph.D, Dean of the Perelman School of Medicine. Dr. Jameson opened on an enthusiastic note, remarking that now is a “great time to be in the biological sciences,” given our ever-evolving technological and data capabilities. While he admitted that the current funding climate may be challenging, he encouraged postdocs to take a long view of funding, understanding that science funding fluctuates over time, with occasional bottlenecks. He emphasized creativity in securing funding, looking into sources such as the Department of Defense or private foundations. Dr. Jameson encouraged attendees to use their postdoctoral years to grow as scientists, furthering their own research while mentoring others and diversifying their skill sets in areas such as writing or managing others. Next, Dr. Robertson’s lively keynote included a geography lesson sprinkled in with the science. Dr. Robertson described his upbringing and early education in Grenada. As a young student he took an early interest in science, eventually moving to the U.S. to attend college. He spoke of challenges throughout his career, from the culture shock of moving from Grenada to the U.S. to the politics of starting up a lab. Dr. Robertson persisted, completing his postdoctoral fellowship and then creating a successful lab. He eventually moved from his first faculty position at Michigan to Penn, where he specializes in viral oncology research. In addition to his research program, with a strong publication record and scores of trainees, he has developed two LLCs via Penn’s Center for Technology Transfer UPstart program, and is developing a non-profit organization to support involvement of high school students in research. The symposium’s highlight, the oral and poster presentations, was sandwiched into several hours between the opening remarks and closing plenary. Postdocs from thirteen institutions presented their research in fields as varied as biophysics and neuroscience. Dr. Susan Weiss emphasized that the goal of the symposium was twofold – to showcase postdoctoral research and to encourage networking. With faculty and postdocs present from a range of institutions, the networking opportunities were rich. After a full day of talking science, the attendees gathered for a closing plenary by Dr. Higginbotham. This marked her first address to the UPenn communityas an incoming Vice Dean, and she conveyed a sense of optimism and excitement. Dr. Higginbotham emphasized the importance of following one’s passion. And on days when it’s hard to find passion, reminding oneself of the bigger picture – what are the potential impacts of my research on society? She noted that we are all connected to larger societal issues through our research, and reminded us not to lose sight of that. She encouraged postdocs to work toward the eight career competencies (Byars-Winston et al., 2011), and to also think about transdisciplinary work. To become a “T” person, one should anchor oneself in one’s own field, but branch across disciplines when possible. She also reflected on the NIH Biomedical Research Working Group’s 2012 recommendations, which include changes to funding mechanisms and diversifying the postdoctoral experience to include partnerships with industry, government, and foundations. Overall, she emphasized cultivating innovation – a blend of collaboration and diversity. The symposium closed with a reception, giving attendees a final chance to network and share their thoughts on science. Byars-Winston, A., Gutierrez B., Topp S., Carnes, M. (2011). Integrating Theory and Practice to Increase Scientific Workforce Diversity: A Framework for Career Development in Graduate Research Training. CBE Life Sci Educ. 10(4): 357–367. Recently, the Biomedical Postdoctoral Council’s Science and Society Seminar Series hosted Sabine Kobayter, Ph.D., a consultant with Navigant. Dr. Kobayter presented on “The Value of an Academic Career in Consulting.” Dr. Kobayter, who completed her doctoral training at Oxford followed by a post-doc in pharmacology, spoke to the skills that scientists can bring to life sciences consulting. Dr. Kobayter described getting her first taste of consulting while a student, through the Oxford student consultancy group. She encouraged post-docs interested in consulting to seek out opportunities available, for instance at Wharton, to get exposure to consulting and learn more about it. Dr. Kobayter started with a quick explanation of consulting, stating that it is a way to help organizations improve their performance, primarily through analysis of their existing business problems, and developing plans for improvement. She described different types of consulting firms, including management or strategy focused firms such as Bain, tech focused firms such as Deloitte, boutique firms such as Navigant that focus on a niche or specialty area, and independent firms. She noted some distinctions between smaller and larger firms, e.g. working on brief, quick turnover projects to support internal teams at a boutique firm, versus working on major strategic changes in larger firms. She then described some of the project areas that one might get involved with in consulting work – health economics, brand and commercial strategy, research and development strategy, portfolio analysis, and launch excellence. She then presented two case studies to illustrate specific tasks that a consultant might work on. The team members on these projects worked to identify issues, barriers, and opportunities, and to create a tactical plan for the organization. This involved performing internal assessments and meeting with the internal team. In this sort of scenario, deliverables might include a launch strategy, action plan tools, mapping different scenarios, or forecasting profits. She noted that the bulk of a typical day might include data gathering and working on presentations, while a smaller portion of the day would be spent in client meetings or internal meetings. Dr. Kobayter emphasized that those interested in consulting work should focus on developing transferable skills during post-doctoral training – project planning, carrying out background research, and gaining technical skills, which includes working with databases, preparing slides, and giving presentations. For those interested in learning more about consulting, Dr. Kobayter recommended books such as the Vault Career Guide to Consulting, and Leaving the Ivory Tower. She noted that those with science degrees should not be scared off by lack of business training, emphasizing that most consulting firms boast a mix of business and science degrees, and that the two do the same job, but differently. Abstract submission will open in late July, 2013. This FREE event is a great way to practice your presentation skills and to learn about your fellow postdocs’ research. Posters have been very well-attended in past years, and the presenters pleased with the feedback they’ve received. All postdocs served by the Biomedical Postdoctoral Council (BPC) and Office of Biomedical Postdoctoral Programs (BPP) are welcome to present, and all members of the university community are welcome to attend. We invite new members to join the 2013 committee! Committee members gain experience in scientific meeting organization, and have great opportunities to network with other BPP postdocs. If you would like to volunteer for the 2013 committee, or if you have any questions regarding abstract submission, general participation or any other issues please contact Adam Walker, Chair of the BPC Symposium Committee, at bpc.symposium at gmail.com, or the Office of Biomedical Postdoctoral Programs at postdoc at mail.med.upenn.edu.